While We Sleep - John Lehmkuhl / Abe Laboriel Jr.
Beautiful dreamy demo showcasing ambient sounds and the huge low end Omnisphere is capable of. 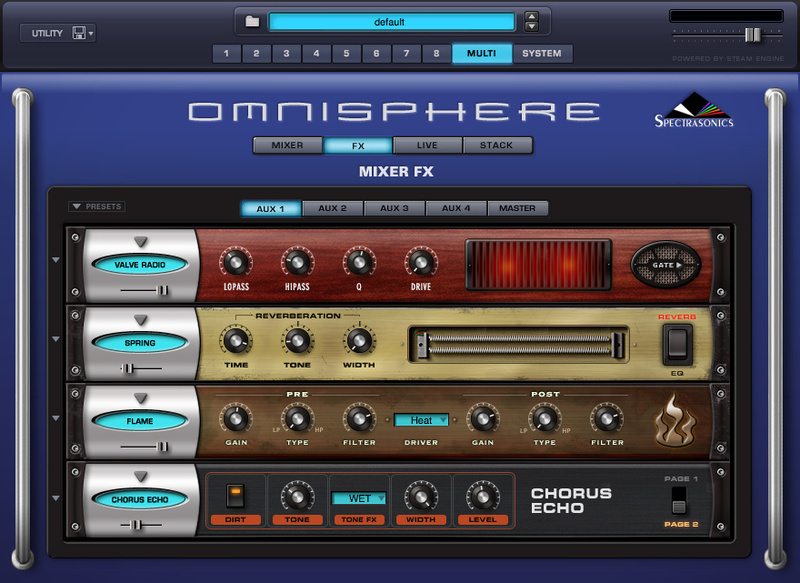 Nice use of Omnisphere acoutsic guitars and synths in a more laidback Urban setting. 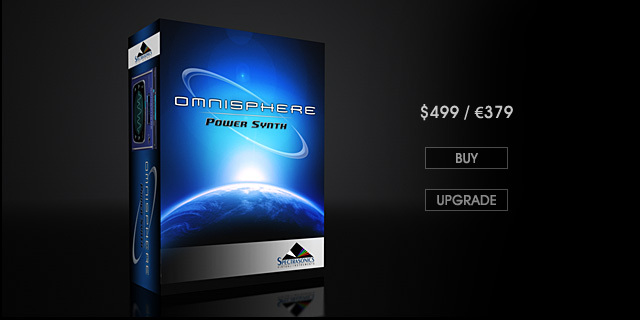 All elements from Omnisphere except Stylus RMX for the drums. 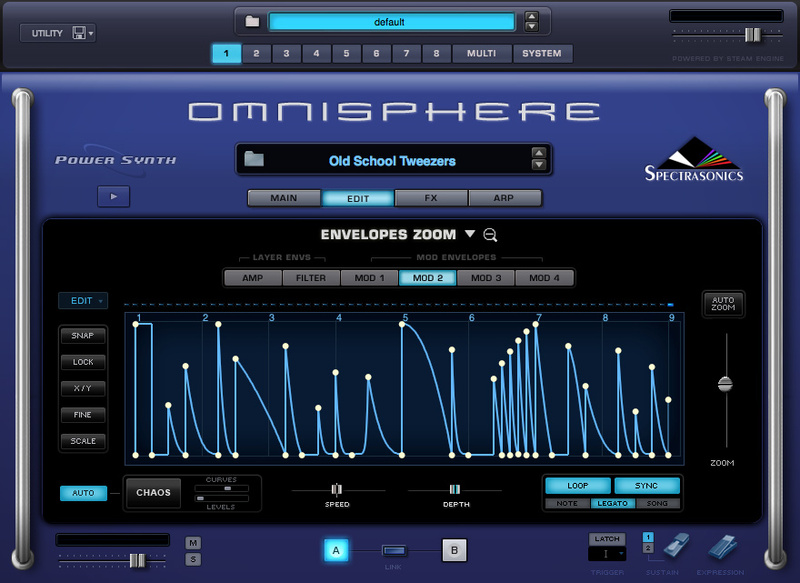 Quirky and fun demo showing some of the more Retro types of sounds in Omnisphere. 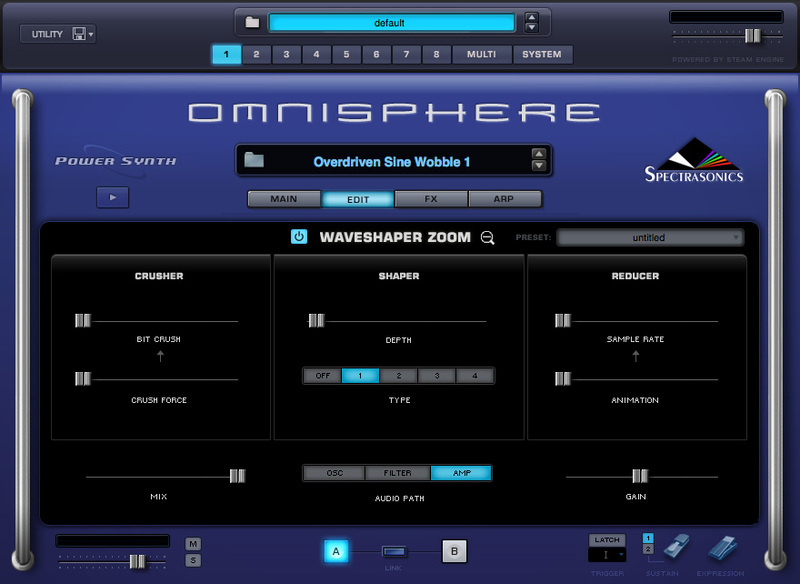 Classic demo of the great sounds from Bizarre Guitar that are available within Omnisphere. 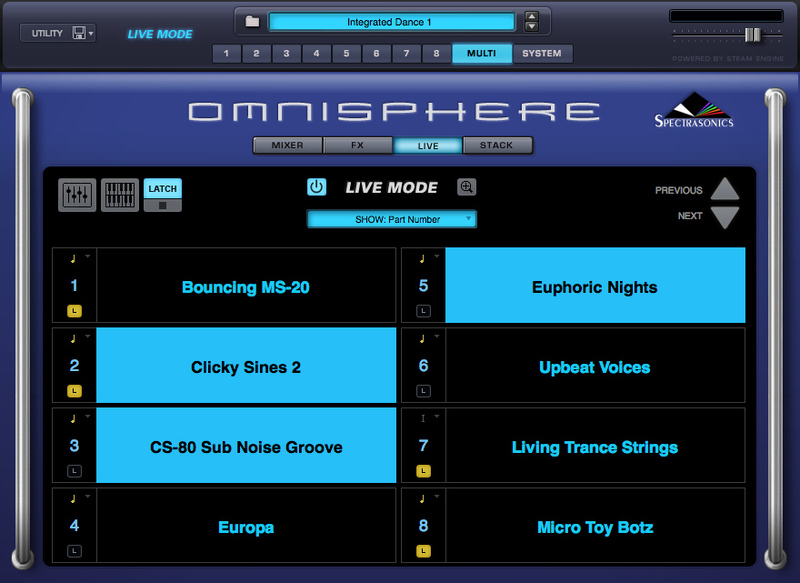 From Choirs to Vocal Pads, Omnisphere has such a wide variety of Voice sounds. 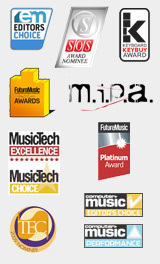 This demo showcases some of the Greorgian Voices, Boy's choirs, London Choirs and more. 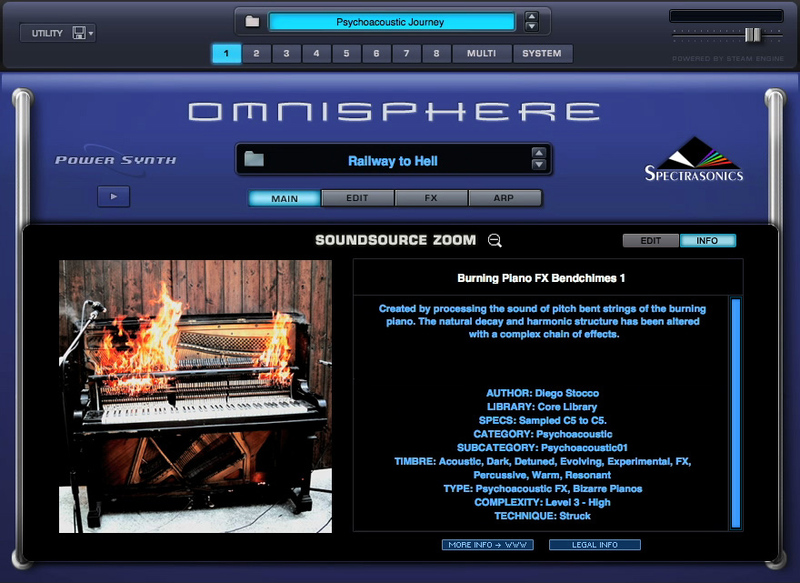 Hauntingly beautiful scoring demo featuring the Chamberlin Strings and Dream Piano. A short example of some of the natural choir swells in various vowels. Various examples of Boys Choir vowels and phrases. 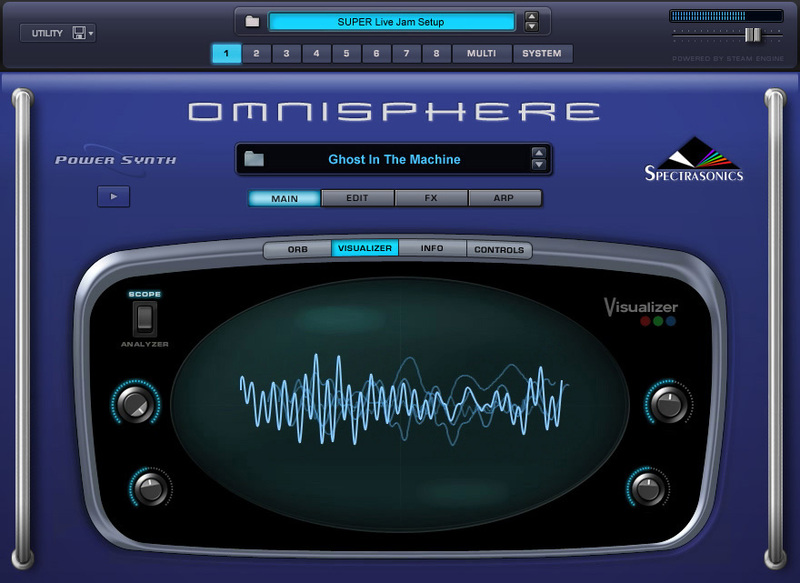 Omnisphere contains many stacked vocal pads that were done by overdubbing various vowels many times on multitrack analog tape with different singers. 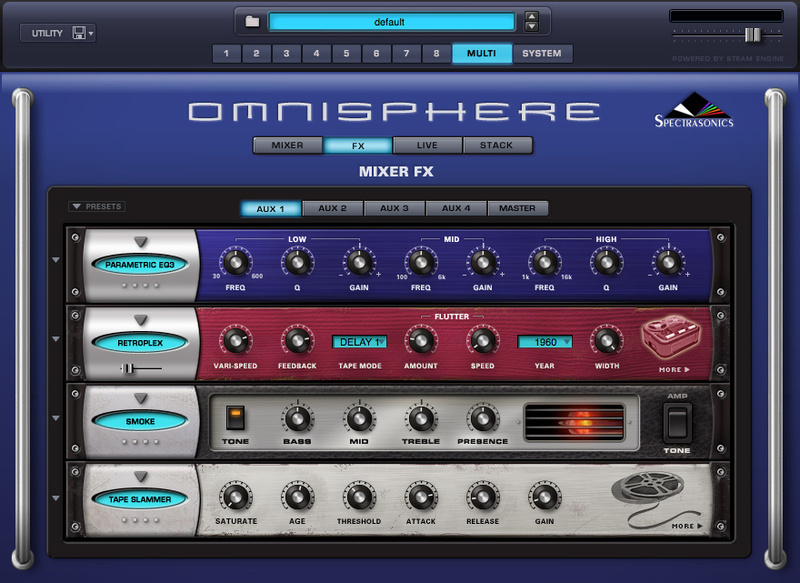 This demo showcases what it's like using a wide variety of them. Shows the Gregorian Male Choir vowels along with phrases from Symphony of Voices. 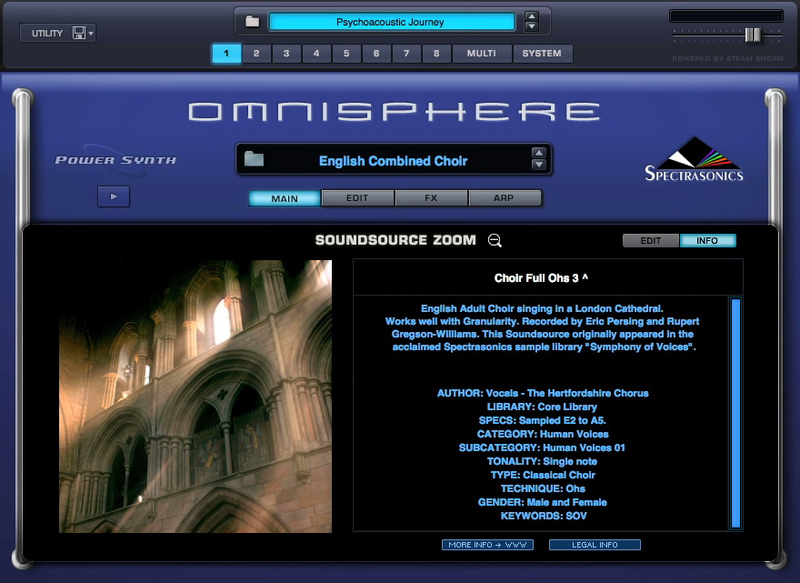 Showcases the London Female Choir soundsources with phrases from Symphony of Voices. Showcases the London Choir whistling and humming soundsources with tenor melismatic phrases from Symphony of Voices. Laidback 80s groove showing some of the layered Pop Stacks pads. 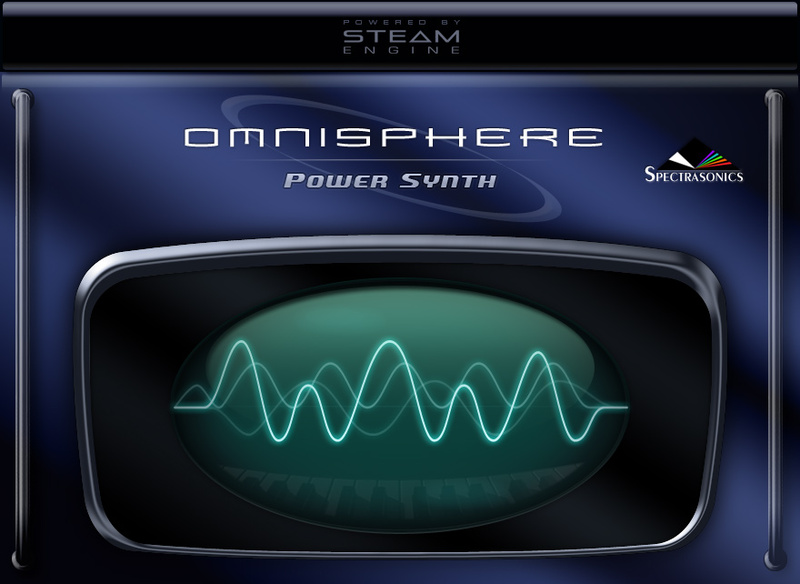 Diego demostrates the crazy Bedside Table Bass custom instrument he built for Omnisphere. It uses the neck of a Bass Guitar fused onto a night table! One of the many interesting Psychoacoustic sounds in the core library. Diego does a disturbing abstract piece demonstrating the Psychoacoustic sounds he created for the core library by bowing a clothes drying rack! 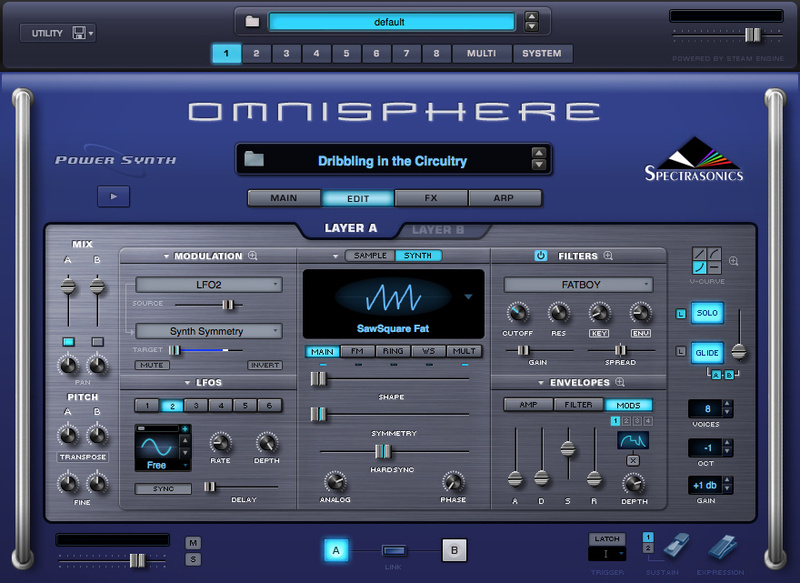 Everything in this demo is Diego playing the "Sonic Washer" custom instrument he created inside Omnisphere. The Sonic Washer was made by attaching a bass guitar neck to a washing machine and stringing it with rubber bands! 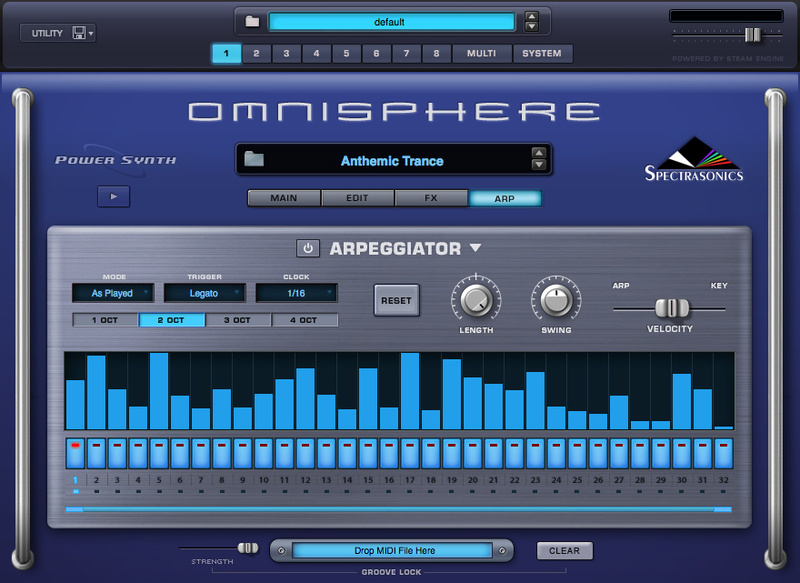 Fantastic original track by Morgan Page created entirely with Omnisphere and Stylus RMX (kick). 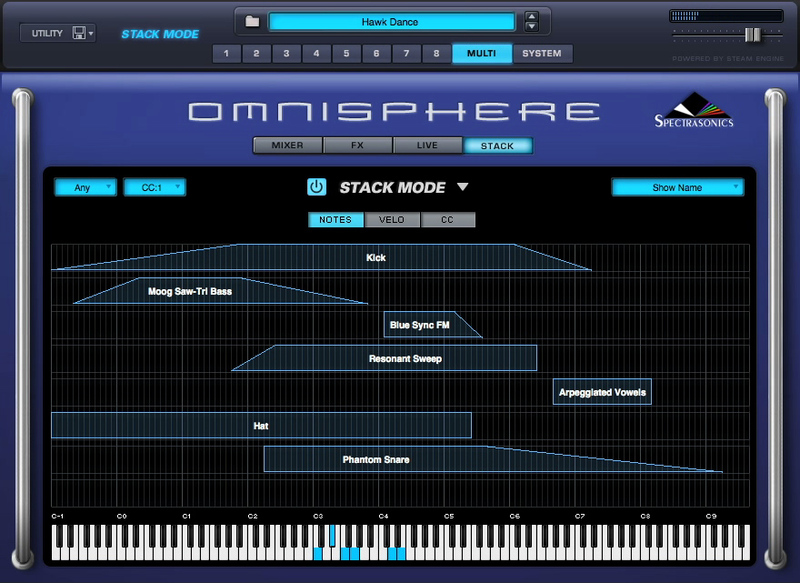 Nice example of Omnisphere's "Dream Piano" which is joined by Strings, Choir and Guitars. 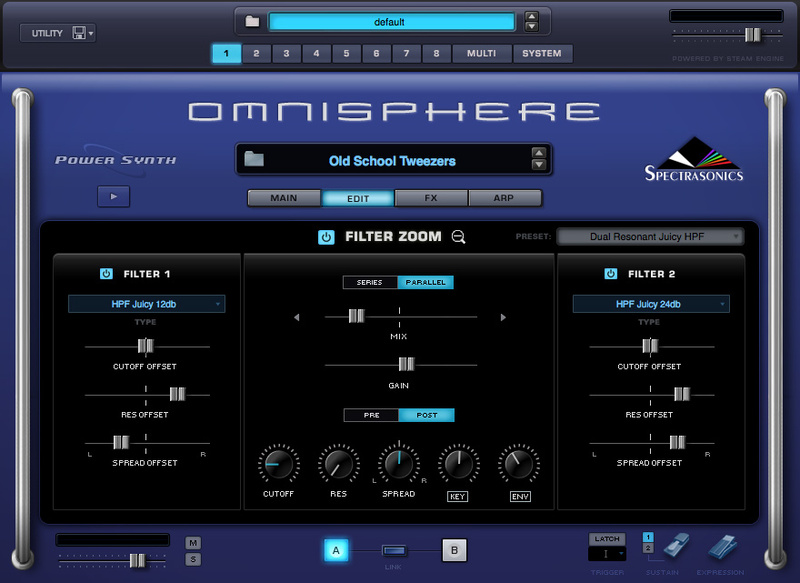 Marc explores some sinister and evil tones with Omnisphere! Chuck's demos are always a hoot! 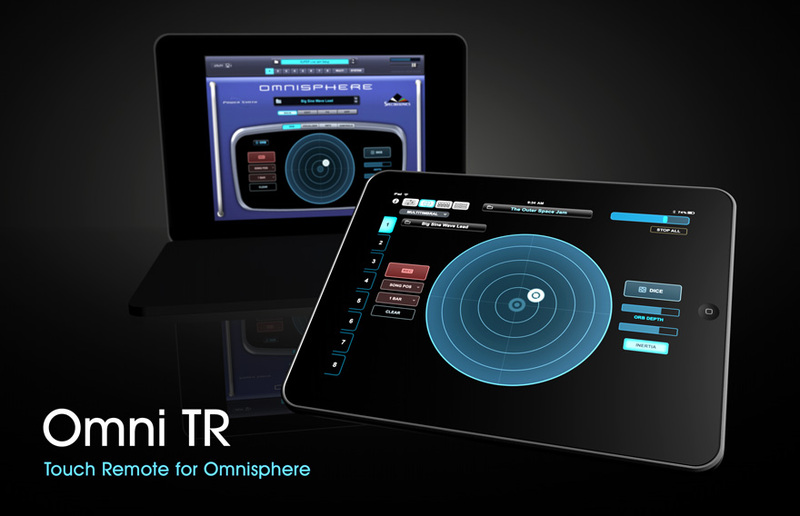 Super funky demo of Omnisphere with Stylus RMX for drums, plus live guitar. Nice chillout mix with live Electric Sitar. 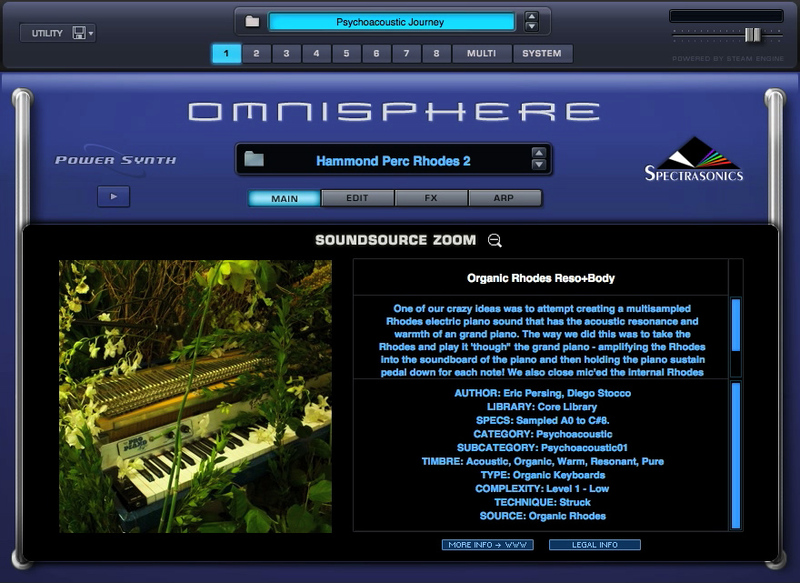 A dream landscape of organic Omnisphere sounds including reversed Dream Piano, Church Chimes, Swinging Tubes, Bowed Vibraphone and Mellotron Flutes. A short demo showing a little of what's possible with the "Big Bertha" trancey supersaws soundsource. 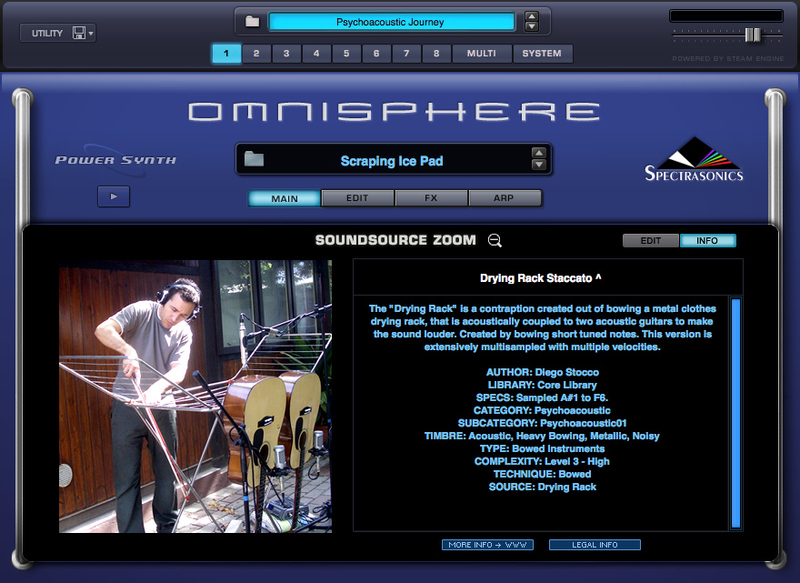 Short demo featuring the Bowed Acoustic Guitar psychoacoustic soundsource. Nice chillout vibe from Marc Pattison. 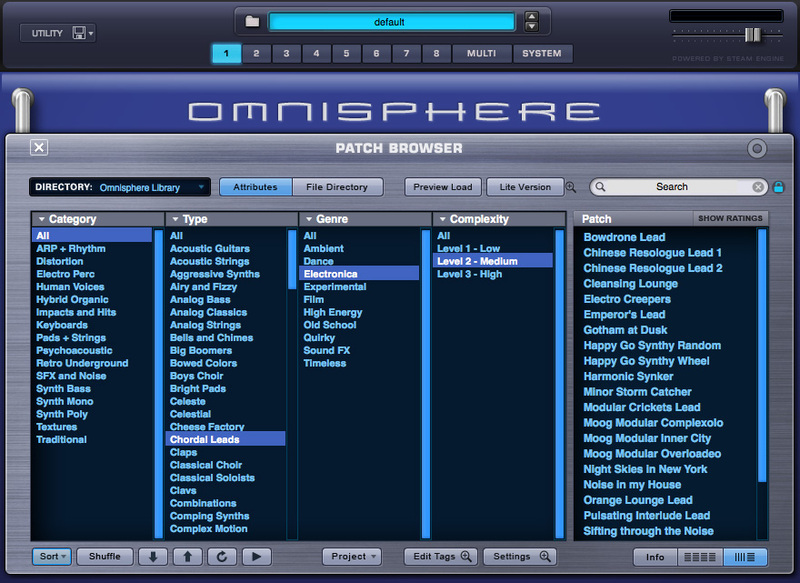 Short example of a spontaneous patch created using dual notch + 12db Bandpass Filters in parallel. 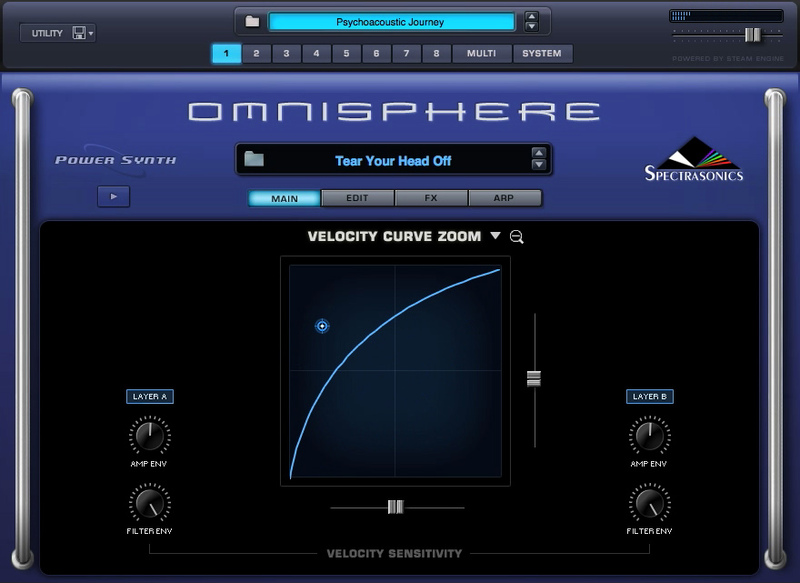 Short demo of the unique Ebowed Gopichant psychoacoustic soundsource. 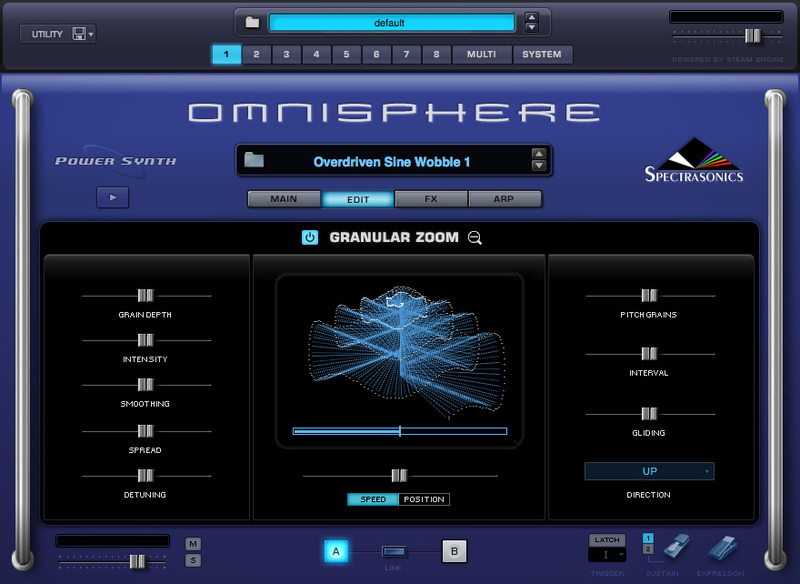 Short example of the unique Elasto hits in Omnisphere. 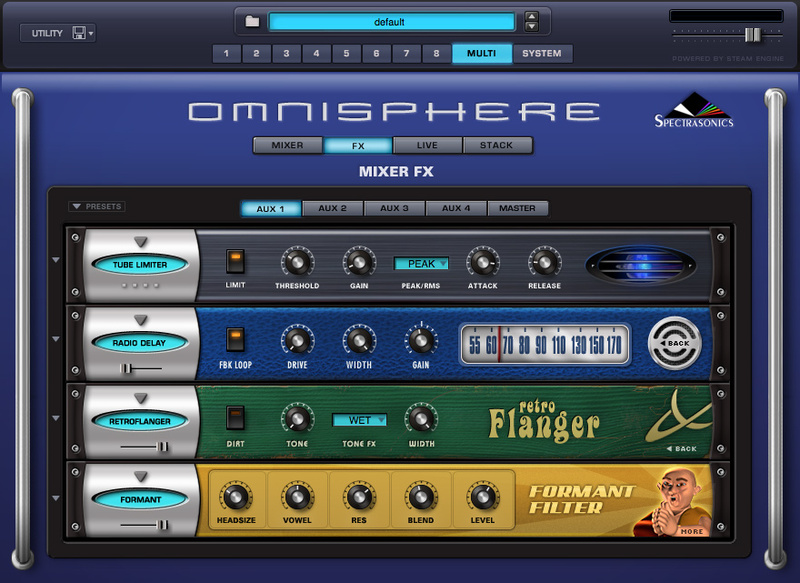 Short demo of the Fairy's Pluck Harp patch. 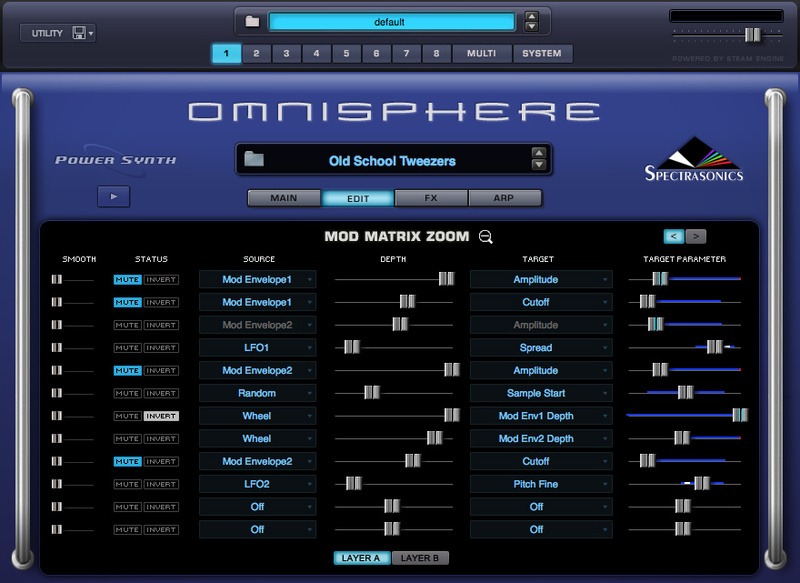 Simple demo showcasing Omnisphere with several patches from the Moog Tribute Library. Short demo of the Indian Banjo soundsource in the style of Thomas Newman. 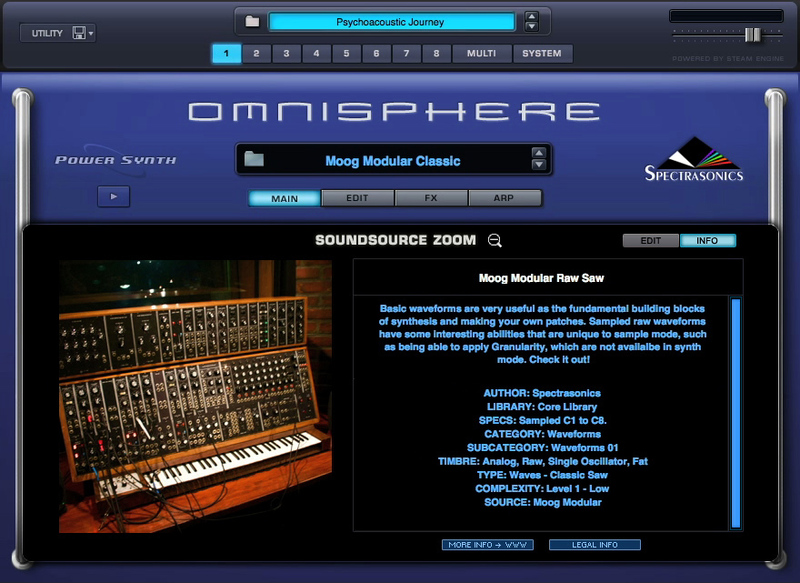 Short example showing the Indonesian Metallophone soundsource dry. 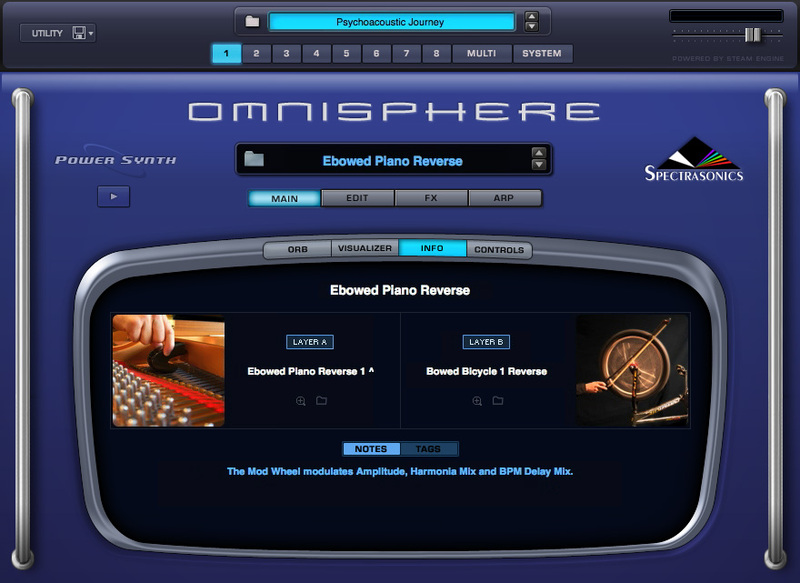 Nice example of how Omnisphere can be used in a commercial pop setting. Fun ultra-retro demo showcasing that Omnisphere is not always so serious and rich sounding...it can do funky cheese pretty well too! 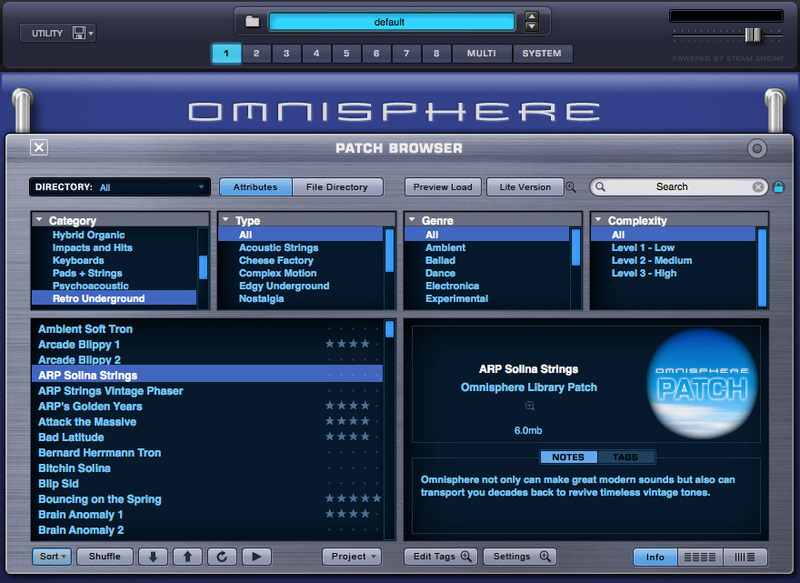 Short example of the Melted Cables patch. 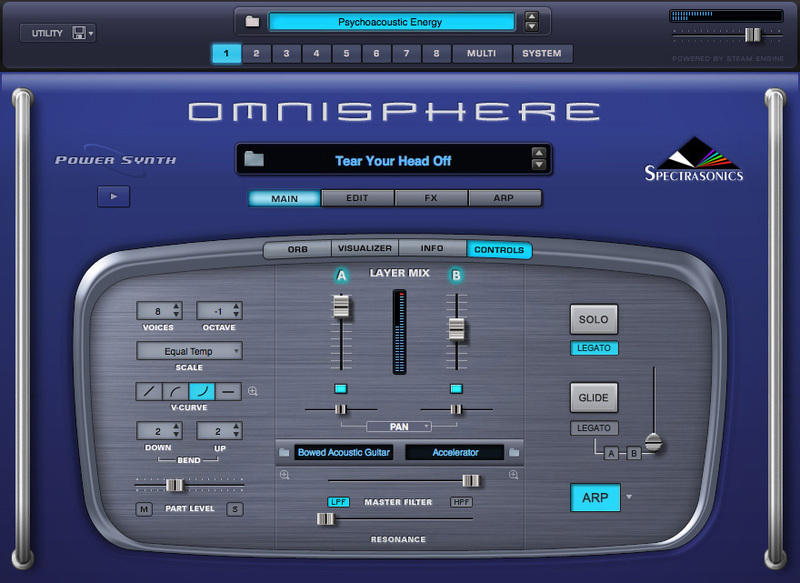 Short example of the Oiltank Music Box sound in Omnisphere, which was created by gluing a small music box mechanism to a giant oil tank which was then mic'ed with contact microphones. 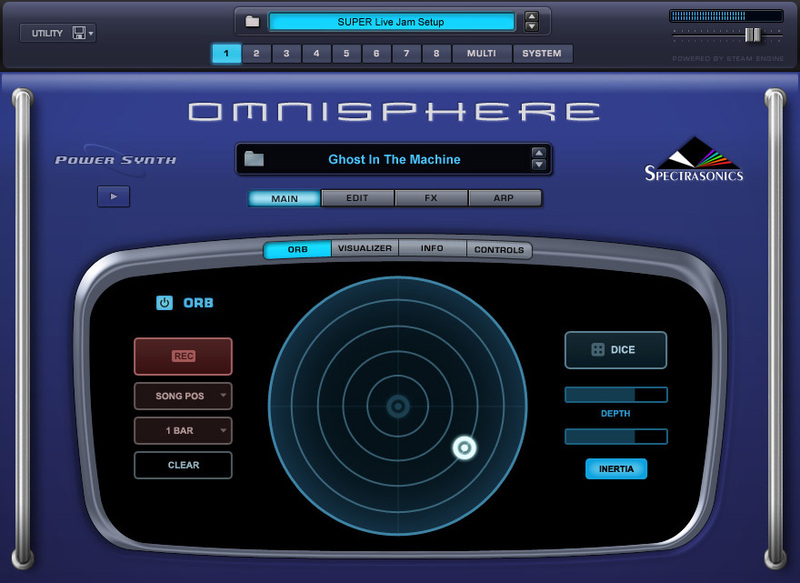 Short example of the Plastic Stratocaster Guitar which was used to create interesting plucked timbres in Omnisphere - sounding very much like a Japanese Koto. 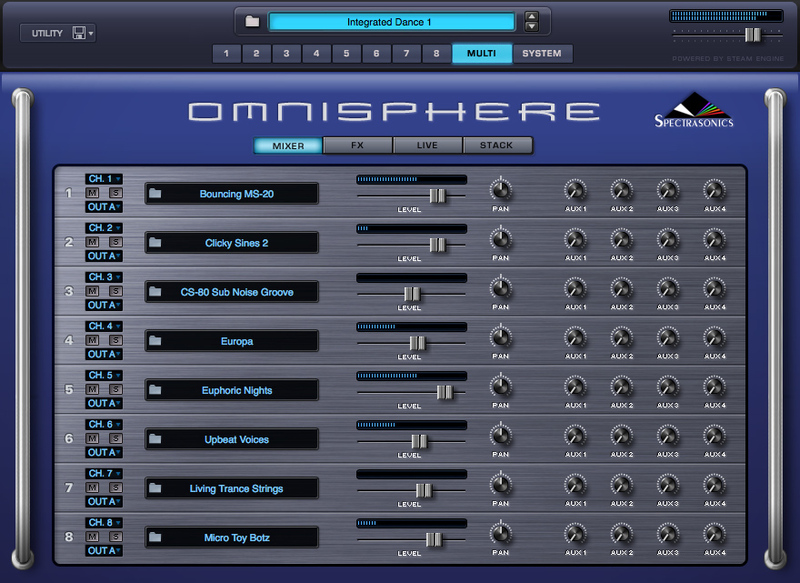 Short example showing what can be done with the Reversed Toy Piano composite morphing soundsource in Omnisphere. 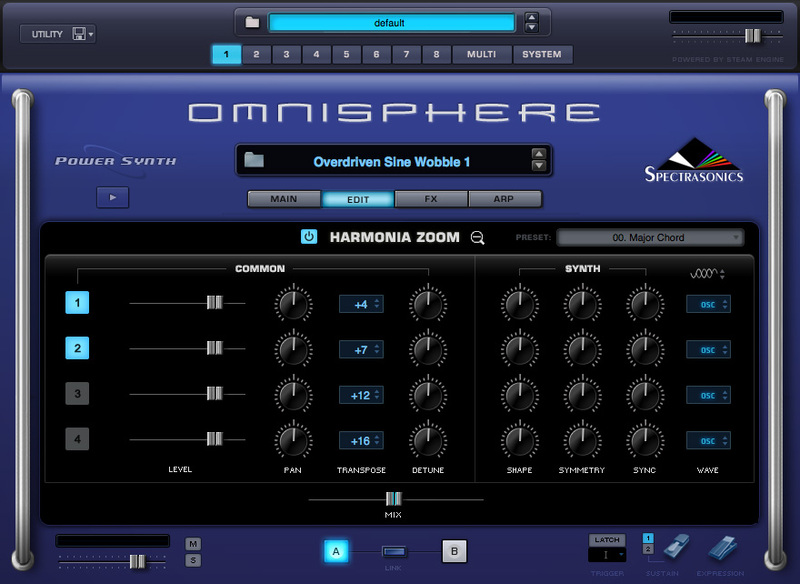 Short example of playing the School Mallets bell soundsource in Omnisphere.